Unfortunately this functionality is only available to you by firing up the command prompt and executing various commands manually. 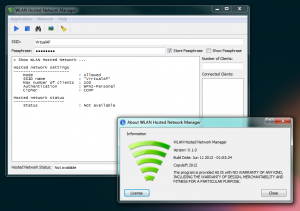 With WLAN Hosted Network Manager you can create / start / stop a WLAN hostednetwork also known as Virtual WiFi Network. The GUI executes the needed netsh commands for you. The only thing you need to set up manually is Internet Connection Sharing on your Wired Network Adapter to the WiFi Miniport Adapter at Control Panel\Network and Internet\Network Connections. More information and download links are available on the WLAN Hosted Network Manager project page.